StockAde's exclusive cordless gas operated 9 gauge fence stapler! This is a smart tool - the ST400i senses the temperature with each trigger pull and applies the right amount of gas so you are just as efficient in freezing weather as hot weather. No hose required cordless internal gas operated 9 gauge, industrial strength stapler! 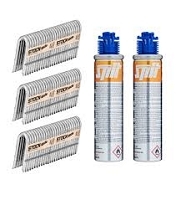 Drives the same 9 gauge staples as the ST400 pneumatic into fence posts or utility poles. Excellent for those jobs where a hose just can't go. The ST400i is capable of driving 9 gauge staples into pine, cedar, or the hardest of hardwoods. Check out the independent review at Pro Tool Reviews. Fuel cells are shipped with the staples. Two per staple carton.